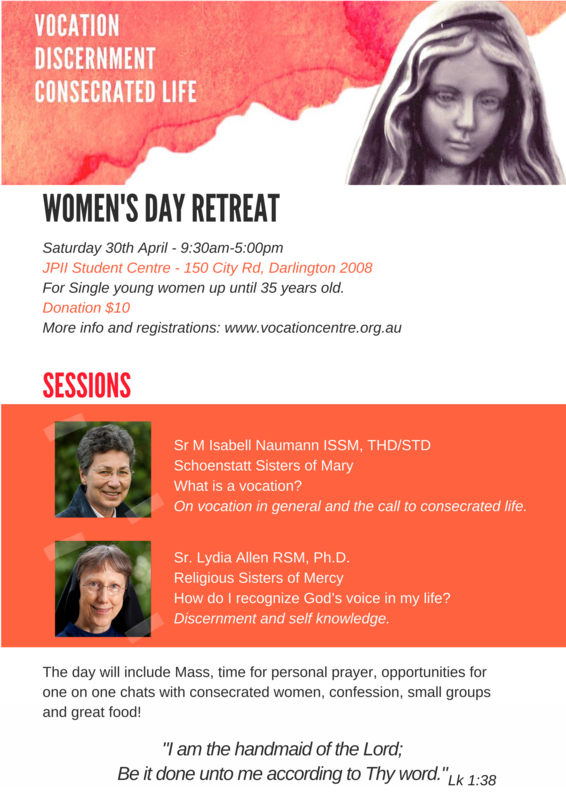 A day for young single women to learn more about consecrated life and vocation discernment with plenty of time for personal prayer and reflection. The day will include Mass, time for personal prayer, opportunities for one on one chats with consecrated women, confession, small groups and great food! On vocation in general and the call to consecrated life. How do I recognize God’s voice in my life? Sr. M. Isabell is a member of the Secular Institute of the Schoenstatt Sisters of Mary (ISSM) and has been Dean of Studies at the Seminary of the Good Shepherd, Homebush since 2007. She holds a Doctorate of Sacred Theology from IMRI, University of Dayton/USA and the Pontifical Institute Marianum, Rome/Italy and is a member of the Pontifical Council for Culture. She also works in Adult Faith Formation and is a teacher and speaker in the tradition of Schoenstatt..
Sr. Lydia is a licensed clinical psychologist in charge of Human Formation at the Good Shepherd Seminary. She has practiced clinical psychology with adults, including priests and Religious, and with children in private practice settings in the USA and Germany. She is a consultant at the Congregation for Catholic Education at the Vatican in Rome, Italy. Sr. Lydia has taught Transactional Analysis in workshops throughout Europe, in the US and Israel. Please include your full name when registering.